The church of Hallgrimur is the crown on Iceland's capital with its magnificent 73 m high steeple rising above all other buildings in Reykjavik. It is the largest church of the country with a seating capacity for 1200 people in the nave. It was under construction longer than any other building in Iceland and has at times generated considerable controversy. Ideally situated on the hill Skolavorduholt, overlooking the centre of old Reykjavik, the site for Hallgrims church was in fact set aside early this century for the purpose of building just such a large church to serve the eastern part of the rapidly growing town. The name of the Rev. Hallgrimur Petursson (1614-1674), without a doubt Iceland's most beloved poet, was soon linked to the plans for the proposed church. He influenced the nation's spiritual development perhaps more than any other person, and generation after generation of Icelanders have read, memorized and quoted his best known work, Hymns of the Passion. Iceland adopted Christianity in the year 1000 and was a part of the Roman Catholic Church until the Reformation in the 16th century, when the Icelandic church became Lutheran. to this day about 95% of the Icelandic population belongs to the Lutheran Church. State Architect Gudjon Samuelsson (1887-1950) was commissioned to design the Hallgrims church in 1937. He designed many buildings to be seen throughout the country. The most famous are the main building of the university, the National Theatre, the Roman Catholic Cathedral in Reykjavik and the Church of Akureyri. His goal was to create a style of national architecture in the same manner as many of his contemporaries in the other Nordic countries, using motifs and materials from the Icelandic nature with basalt formations playing a prominent role. The design of the Hallgrims Church, his final and greatest achievement, is reminiscent of the rugged mountains and icecaps, which dominate Iceland's landscapes. Inevitably the design engendered controversy, especially its size and the towering steeple. Nonetheless a large number of people was determined to see the project through and the design remained unchanged. The Crypt under the Choir of the church was consecrated as a chapel for the congregation in 1948. The steeple and both wings were completed in 1974, providing the congregation with a better place for worship and other facilities. The nave was consecrated in 1986 on the bicentennial of the city of Reykjavik. 60% of the cost of construction has been raised by the congregation and private donations from all over the country, even from abroad, but government and city contributions have increased in latter years. In December 1992 a grand organ of 72 stops, commissioned from Johannes Klais in Bonn, was inaugurated. The organ, by far the largest in Iceland, has four manuals and pedals, 5.,275 pipes and mechanical tracture. It stands 15 meters high and weighs some 25 tons. Already it has been used frequently in concerts as well as in religious services. In 1997 a new console for the big organ was installed in the nave. The older and much smaller choir organ with 10 stops, built in 1985 by Th. Frobenius & Sønner A.S. organ builders in Denmark, is in the nave and still in use. The cost of installing the organ called for a major fund raising effort with pipe sponsorship as the central feature of the campaign. If you would like to sponsor a pipe, there is still time, just have a word with the church warden. The amount you donate will be dictated by the size of the pipe. In return you will receive a certificate. Another way of raising money is through the sale of a CD of the inauguration concert and various Icelandic organ works, played by Hordur Askelsson, the church organist. For this purpose other CDs recorded here in the church are also for sale. While the new organ was being installed, the opportunity was taken to put in place a new seating arrangement in the nave, so that with the loose seating still available, large numbers may attend major concerts held in the church from time to time. The Hallgrims church has many other interesting features. The main door into the sanctuary was designed and made by the artist Leifur Breidfjord, best known overseas for his stained glass windows, including the Robert Burns memorial window in the St. Giles Church in Edinburgh. Leifur Breidfjord was additionally responsible for the pulpit decorations, the costs of which were met by donations on the occasion of the Bishop ermeritus, Dr. Sigurbjorn Einarsson's 70th birthday celebrations in 1981. The pulpit, inaugurated on Whitsunday 1993, is decorated with symbolic representations of the Trinity and the Greek initials of Christ (X and P) surrounded by Alpha and Omega. The verse on the canopy is from the 44th Hymn of the Passion and the dow under the canopy represents the Holy Ghost, while the colours green and lilac are respectively the colours of remorse and Lent. Leifur Breidfjord is also responsible for the large, stained window above the front entrance of the church. This piece of art, which was added in 1999, is called "Glory - Power - Respect". The statue of Christ is by the sculptor Einar Jonsson and was donated by him in 1948. The statue depicts Christ at the moment the Spirit descends on him at his baptism. The smaller statue, also by Einar Jonsson, is a memorial to the Rev. Hallgrimur Petursson. A third sculpture, entitled Marurium, is by Sigurjon Olafsson. The church also possesses a copy of the first Icelandic Bible, Gudbrandsbiblia, printed at Holar in 1584. The baptismal font is only provisional, but when a permanent one might take its place is not yet clear. The bowl of the baptismal font is on loan from the National Museum of Iceland and shows the Annunciation. Work on a permanent font is underway. There are various exhibitions to be viewed in the foyer. A small chapel is to be found in the north of the church. In the rooms and corridors of the church, various pieces of art can be seen, i.e. water colours by the Icelandic painter Karolina Larusdottir, a stained glass window by Gudmundur Einarsson, a painting by the Danish artist Stefan Viggo Pedersen and the Norwegian painter Bjorn Bjornebo. The parish of the Hallgrims church comprises about 6000 people. It is served by two ministers, a deaconess, an organist, a children's choir director, church wardens and youth workers. A group of volunteers take part on many levels of the services and the cultural activities. The chaplains of the University Hospital are affiliated to the church. There is a service of worship at 11,00 am every Sunday, a prayer service every Tuesday at 10,30 am and a prayer service, organ playing and lunch every Thursday at 12,00 noon. During Lent there is a service every Wednesday at 08,30 pm and prayers on other weekdays at 06,00 pm. There exists a rich artistic and cultural life at the Hallgrims church. The Motet Choirs is among the best choirs in Iceland. it was founded by the church's organist and cantor in 1982 and since then it has given numerous concerts and toured most countries of Europe. CDs with music sung by the choir are on sale in the church. Members of the choir lead the singing on Sundays. there is a very active children's choir affiliated to the church and in 1996 the chamber choir Schola Cantorum was founded. It has already received excellent critics for its singing. The Society of the Friends of the Hallgrims church supports concerts, art exhibitions and dramatic events, which attract many people to the church every year. It has organized four Festivals of the Sacred Arts around Whit sun. It also arranges the „Summer Evening by the Organ" concert series in July and August every year. In December 1996 the Art Collection of the Hallgrims church was founded. It has the objective to keep and preserve the various items of art owned by the church and to exhibit these and works of artists, who work with sacred art Many non-cultural events and activities, such as meetings and conferences, take place in the church the whole year round. The Icelandic Bible Society, founded in 1815, has its headquarters in the church. Four AA groups meet in the crypt every week. The steeple is among the best known and most visible of Reykjavik's landmarks and provides an unmistakable signpost for the city's visitors. The view of the capital and its surroundings is superb from a platform 83 meters above sea level. The steeple is open to the public against a small charge for those who use the elevator, which proceeds go towards the maintenance of the church. There are three big bells in the steeple and a carillon of 29 bells. The big bells carry the names Hallgrimur, Gudrun and Steinunn, named after the Rev., his wife and a daughter, who died young. All the bells are gifts from individuals or groups. They are inscribed with the names of their donors and the person in whose memory the gifts are made. 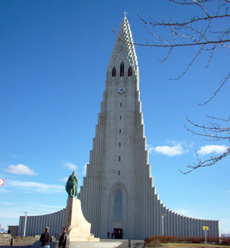 The carillon is the first in Iceland and the church is one of only three churches in Reykjavik, which chime on the hour. The beautiful nave is open every day for anyone, who wishes to pray and meditate or simply seek solitude. Thus, the Hallgrim's church is not only a monument to the memory of a great man, but also plays an important role in the collective effort to satisfy the social as well as the spiritual needs of the people of Reykjavik.